Through our extensive programs we provide help to those in need in Ghana. Read below and review all of our programs. We provide daily nutritious meals to help in the wellness, healthy growth, and development of orphans and poor children of Ghana. Our food program feeds over 50 poor children and successfully serves as an incentive for the children to go to school instead of going to the farms with their parents. This has been a very effective way of getting the children to school and to engage in our sports activities as well. Our health initiative program improves the health of the children and adults in the community. Due to the economic hardship, many parents find it difficult to send their children to receive treatment when they are sick. As a result, this has led to more deaths in the community. According to the World Health Organization (WHO), nearly 90% of the population of Ghana lack adequate toilet facilities. This leads to an increase in infections linked to contaminated water, such as diarrhea, cholera, and schistosomiasis. Also, 1 in 9 people in Ghana die each year from malaria, and many children have lost one or both parents to HIV/AIDS. 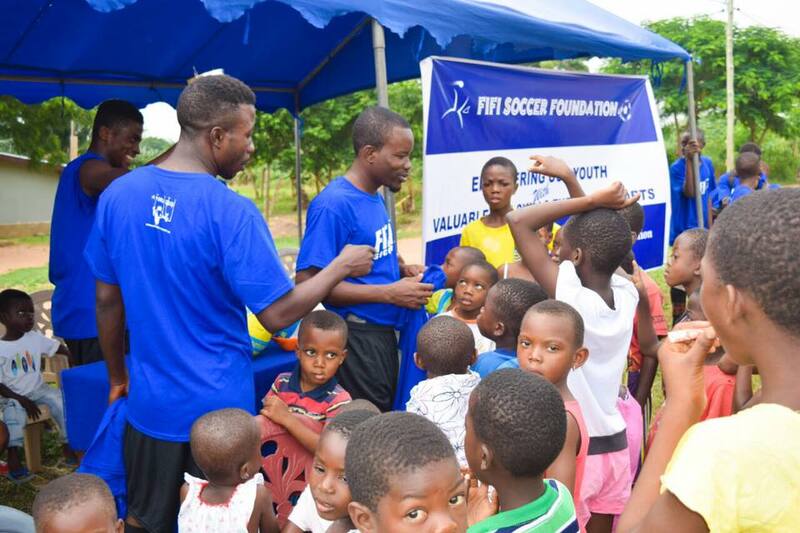 Fifi Soccer Foundation health initiative program raises awareness about personal hygiene, malaria, HIV/AIDS, teenage pregnancy among others. Our counselling program serves to improve the emotional and psychological wellbeing of the orphans and poor children. Our special counselor teaches the children about ways to rise above their harsh upbringing. This program is important because it helps to remove the scars of trauma that these orphans and poor children live with everyday. We hope to boost their confidence and encourage them to work hard and become better citizens of change. Our adult education program helps to improve the literacy of the adults in the community. We teach parents about the value of education and the overall importance of encouraging their children to go to school. Our Adult education program takes place every Friday evening. For many Ghanaians, like Fifi, sports have provided the tools to escape the harsh realities of poverty. Fifi Soccer Foundation provides a sports curriculum that improves the skills of the community children as well as our selected soccer academy. During Physical Education (PE) session, the community children take part in our sports activities such as basketball, volleyball, track, and soccer. Our selected boys soccer academy players also train twice a day to improve on their soccer skills. Our community involvement program is designed to promote hygienic and sanitary environment. All the children and adults in the community engage in a thorough cleaning of the community on Saturdays. They take out trash, clean out gutters, remove weeds and dead leaves. This helps to reduce malaria by removing the breeding grounds for mosquitoes.